The indigenous Tembé denounce the mining company VALE and Biopalma, for contaminating the water sources with agrotoxics (such as endosulfan) in the new large oil palm plantations in Pará. Since 2006, oil palm expanded over the Pará region. The company VALE grabbed land in this region, consequently, many people was dispossessed from their territory and forest was destroyed . 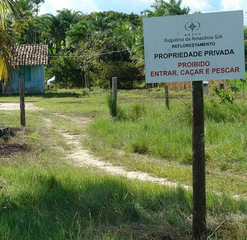 According to Cimi report on violence against indigenous people , the indigenous peoples denounce the Biopalma da Amazônia company, a subsidiary of Vale, for the impact of the contamination of water courses by pesticides. The company is accused of disregarding the distance from the water course (known as "igarapé" in the Amazon) that cuts through the indigenous land and of diverting too much water toward their crops. According to the community, the oil palm plantations are drying up the sources of rivers. As a consequences, the local population are getting ill. Since 2012, the indigenous Tembé from the North of Pará have been trying to get compensation and mitigation actions for these impacts . They also mentioned that it is mainly men who find work with the companies, but working conditions are often akin to “slavery”. In 2014 the Evandro Chagas Institute confirmed water contamination with for example, endosulfan, a highly dangerous product for human health and already banned in several countries . In 2016 the Biopalma company asked the the Federal Justice to ban indigenous demostration in the region of oil palm expansion. However the Public Ministry - MPF-, requested to the Federal Justice the cancelation of the Biopalma legal process against indigenous people, and the company to participate in a hearing with the També . Project Details Their oil palm plantations are located in the Mojú, Tomé-açu, Concóndia do Pará, Bajaiú, Iguarapé-Miri y Acará. Oil palm employs 10,900 people. In 2012, oil palm covered 140,000 hectares in Pará, and 67% of the production went to the food and cosmetics industries and 33 % to biofuels, according to a study by agronomist D’Alembert Jaccoud . Biopalma produces biodiesel for Vale's locomotives, "clean energy" allegedly saving CO2 emissions. Pará is the main producer of palm oil (dende) in Brasil. There is a palm oil extraction plant belonging to Biopalma to produce biodiesel in the municipality of Moju, 150 km from Belém, at a cost of 500 million USD for building it . re-emergence of illnesses such such as Chagas disease. Why? Explain briefly. The land grabbing and the water grabbing and polluting continues. Use of endosulfan. [Biopalma inaugura primeira usina de extração de óleo de palma no Pará. Assessoria de Imprensa Biopalma 26 Jun 2012. "A Biopalma da Amazônia S.A., empresa da Vale em sociedade com o Grupo MSP, inaugura hoje a sua primeira usina extratora de palma (dendê), localizada no município de Moju, a 150 km" de Belém. "